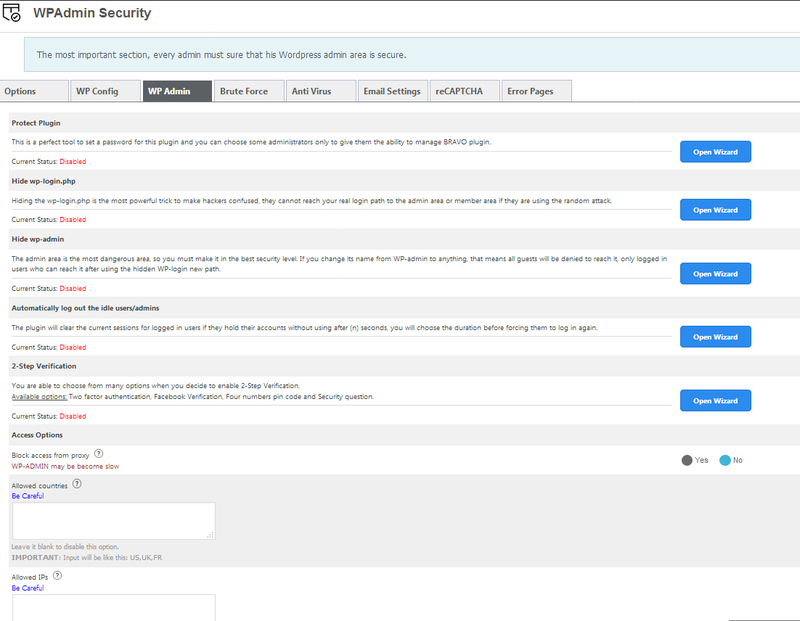 Bravo WordPress Security Plugin is the choice for all your website security needs from Hide Wordpress Completely to Firewall, AntiVirus, 2 Factor Authentication, reCaptcha and more!. WordPress is fast becoming the CMS of choice when it comes to easy to install, simple to use and relatively secure websites right out of the box. But the more you customize and change by adding your own Theme, tweaking PHP and adding Plugins for increased functionality, the easier it becomes for your site to be hacked. Keeping your site secure is so important for obvious reasons – maximum uptime, increased growth, no abandoned shopping carts, customer data security and maintaining a website that runs smoothly and reliably as possible are all super important. With Bravo you can manage all of your security needs from the one simple interface with the familiarity of the WordPress dashboard – so simple, no coding required. With over 35 fully featured security features it’s hard to cover them all, but check out a few of the most compelling reasons you should Activate Bravo for WordPress on all of your websites today. Hackers scan massive amounts of websites looking for easy vulnerabilities to exploit and one thing they can take advantage of is unsecured WordPress websites, especially those that don’t change default Passwords or leave the username Admin as the default login – yeouch! 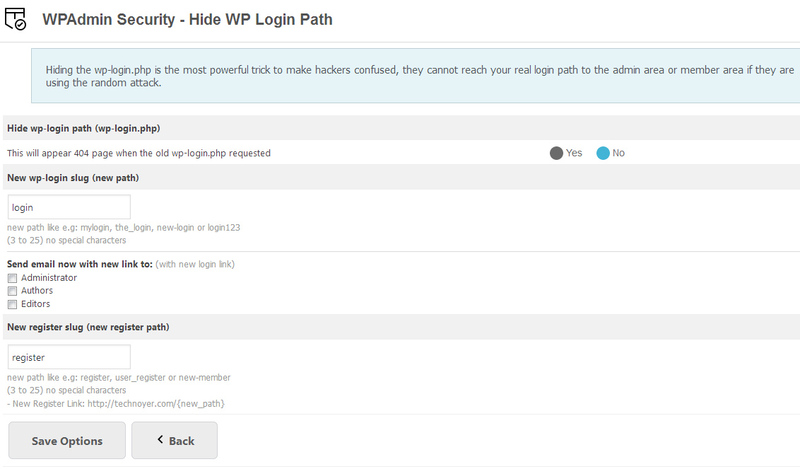 With Bravo for WP you can easily hide the wp-includes path from the page source, remove the wp-admin login from non-logged in users and hide theme paths. 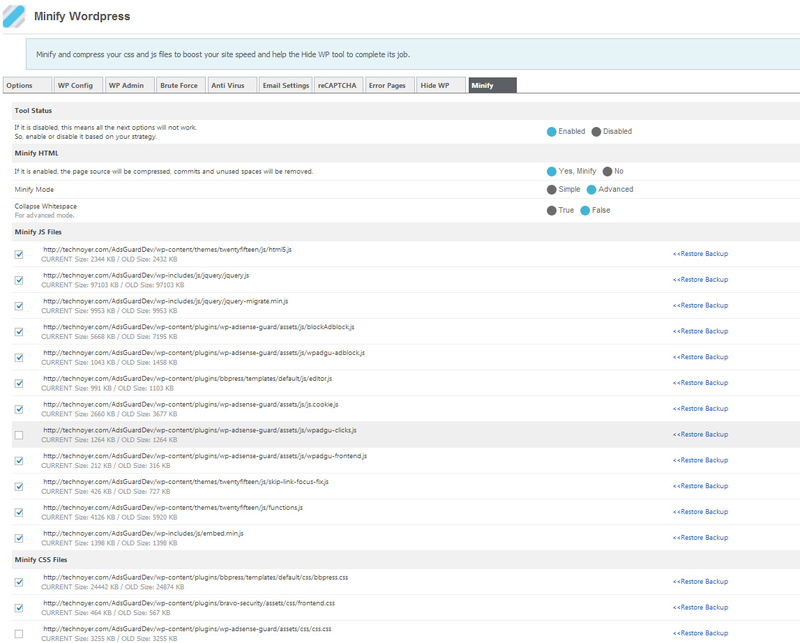 All of these things means most mass scans will pass right over your site and move on. How good is that? A simple thing that many developers, designers and users overlook, but also one of the best ways to increase your security! Enabling Two Factor Authentication with Bravo for WP is easy and comes with options including Facebook Verification, four number PIN codes and your own unique Security Questions – all things which will increase your security and decrease your vulnerability to hackers. 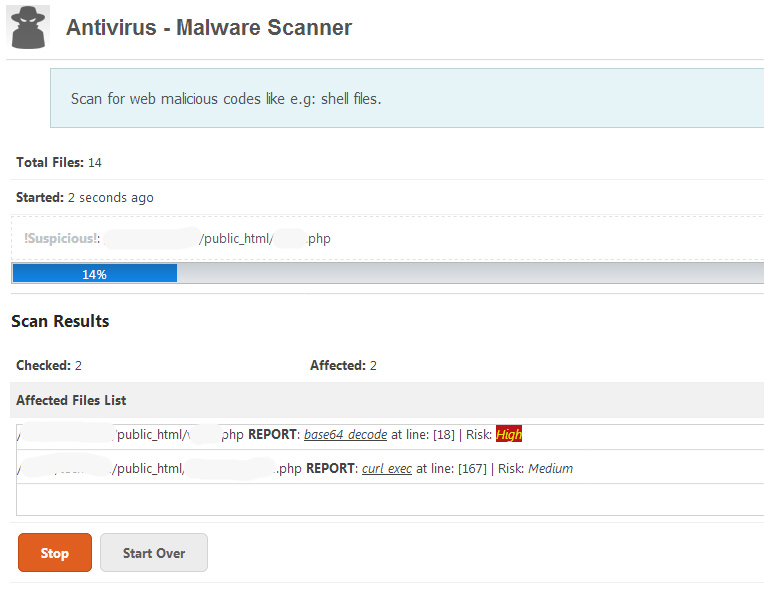 Malware Scanner: Scan for web malicious codes e.g: shell files. PHPMussel Scanner: Scan for viruses and malware files e.g: uploaded files from affected computers. 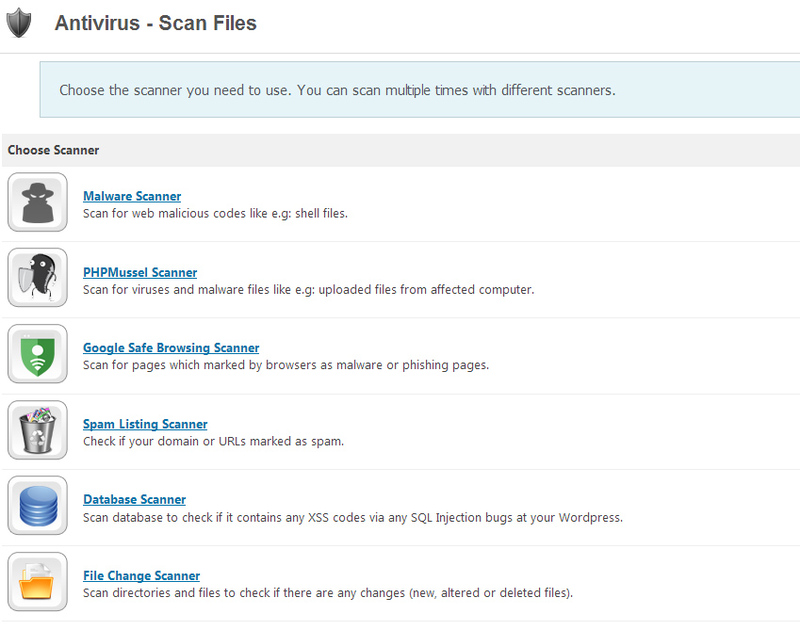 Google Safe Browsing Scanner: Scan for pages marked by browsers as malware or phishing pages. Spam Listing Scanner: Check if your domain or URLs are marked as spam. Database Scanner: Scan database to check if it contains any XSS codes via any SQL Injection bugs at your Wordpress installation. File Change Detection Scanner: Scan directories and files to check if there are any changes. For even more security, after activating any new plugin or Theme, Bravo can create a new antivirus process to scan the new files. It’s comprehensive, ready to go from Activation and multilayered for top level security against viruses. A Firewall is a network security measure that places a set of rules on incoming and outgoing traffic on your website in order to protect servers, websites and of course your users individual computers. It’s not just a way of blocking access to unsafe websites, it’s an important part of your website security and it is fully optioned in Bravo – chose from a Low, Medium or High level of security. Don’t worry if it sounds too technical, a full break-down and video tutorial are available to help you setup the best system for you. Another powerful way of blocking malicious attempts to log-in to your WP install is by initializing Black Lists of certain users and email addresses. Really easy to set up and you can take it as far as you wish with additional functionality that allows you to prevent particular email hosts from registering as well. Ugh.. why do they do it? Brute Force attacks are when a user or a bot (most likely multiple bots) attempt to log into your website over and over again multiple times, even as many as millions of times per hour with guessed credentials causing thousands of login attempts to wp-login.php per minute causing your site to crash and even worse, full site lockouts. 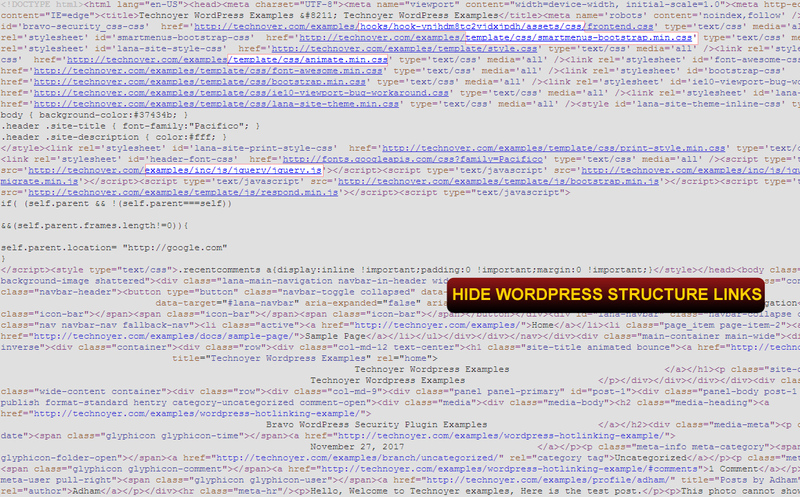 Bravo protects you against this by hiding your wp-login.php files or changing it (it’s up to you! ), enabling 2 Factor Authentication and a range of other class leading security measures that make hacking your site a headache. Huzzah! An excellent way to increase the security of your website and stop malicious spammers dead in their tracks is by using the best practise reCaptcha forms to your Posts, Pages, Logins, Comments and Registration pages. Make sure a human is on the other end of that IP address so you can rest easy and get on with the important work! One of the best investments you can ever make for a small fee is to protect your digital space with a wide range of fool proof security measures in one single plugin. Don’t over-do it with multiple plugins when Bravo can handle it all without the bloat. Simple interface, lifetime support plus lifetime FREE UPDATES means you will always be ahead of the game and your site will be secure without any hassle and no coding required. There are also loads of tutorials and a wiki filled with FAQ to help you get the most out of your new security features. Hide WordPress: Hide version from all scripts and styles call inside the pages source. 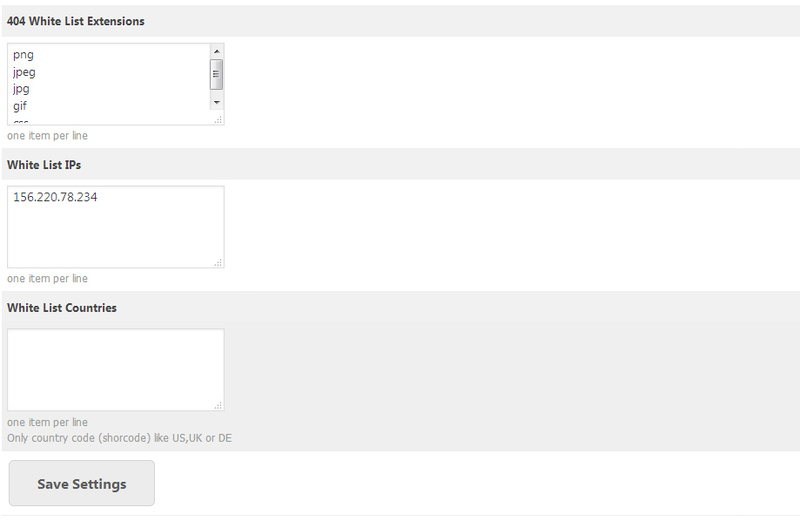 Hide wp-login.php: Create new login link and a 404 error will appear to the default login link. 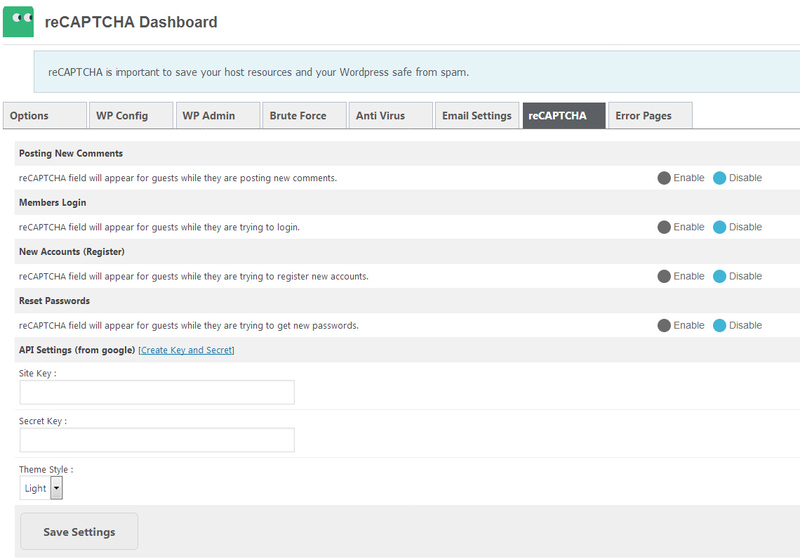 Hide wp-admin: Only the login link can redirect you to the wp-admin dashboard. Prevent Proxy: wp-admin Dashboard will allow real connections only. 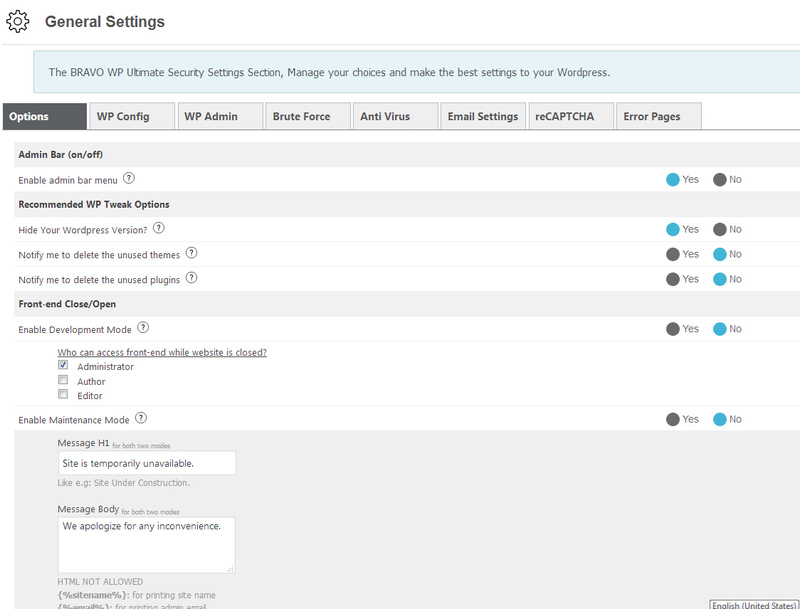 Allow Custom Connections: wp-admin Dashboard will allow some whitelist countries or/and IPs only. 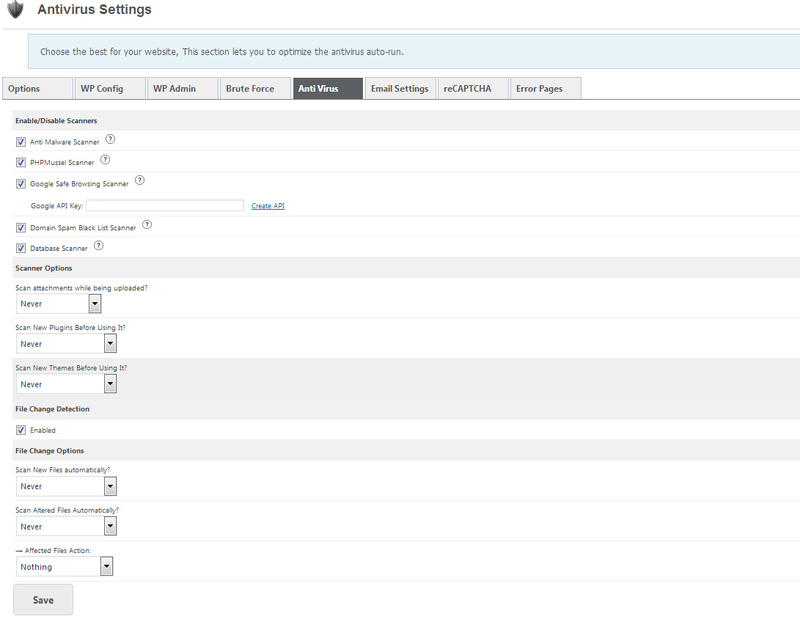 Advanced Firewall: ‘Firewall profiles’ is advanced option, You are able to choose High, Medium or Low Level of security. 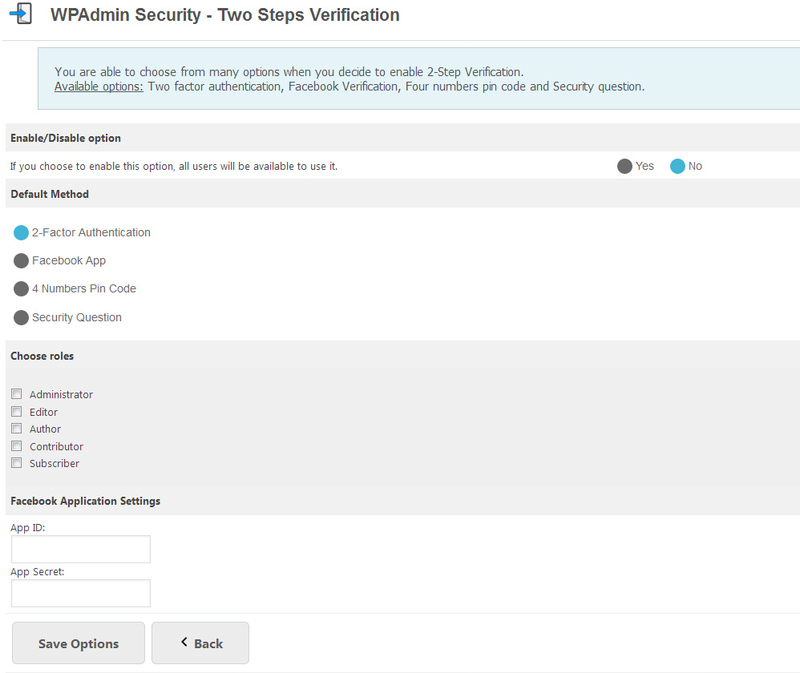 2-Step Verification: You are able to choose from many options when you decide to enable 2-Step Verification. Available options: Two factor authentication, Facebook Verification, Four numbers pin code and Security question. reCAPTCHA: reCAPTCHA is important to save your host resources and your WordPress safe from spam, You can add it to guest comments, login, register or/and reset password forms. 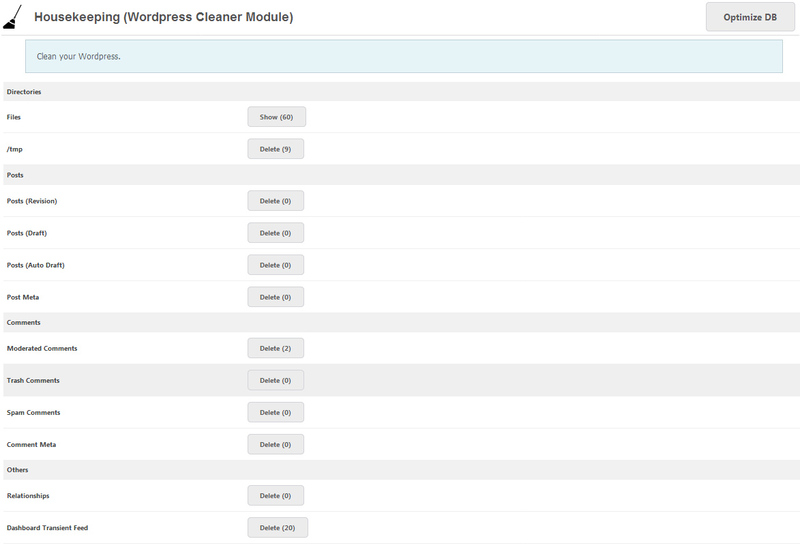 Housekeeping: Clean your WordPress, Just delete unused files, comments, revisions, trashes, transient feed or/and relationships. Database Backups: Manually or Scheduling Database backups, both options are available. Professional Antivirus: Malware scanner, PHPMussel scanner, File Change Detection, Google Safe Browsing Checker, DB scanner and Spam Lisiting checker. 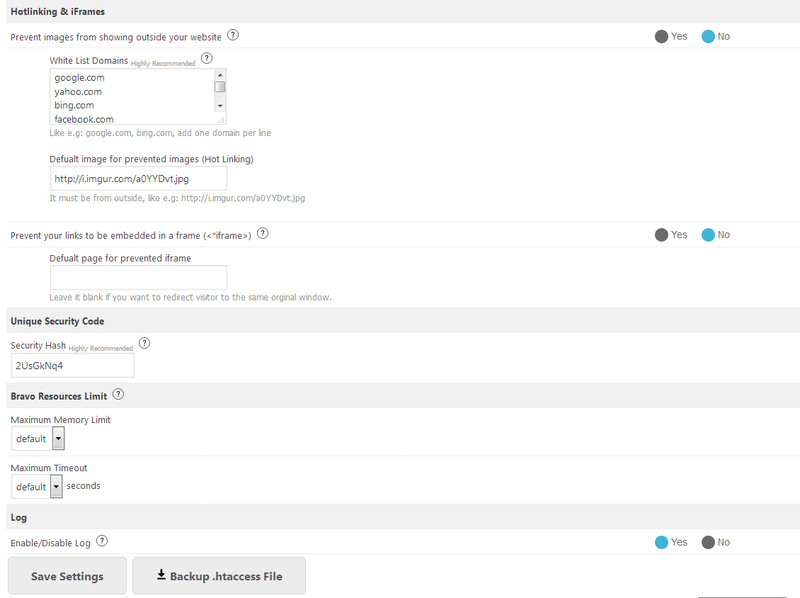 Auto Scan Attachments: Attachments will be scanned while it is being uploading. Scan New Plugins & Themes: After you activate your new plugin or theme, Bravo will create a new antivirus process to scan the new files. 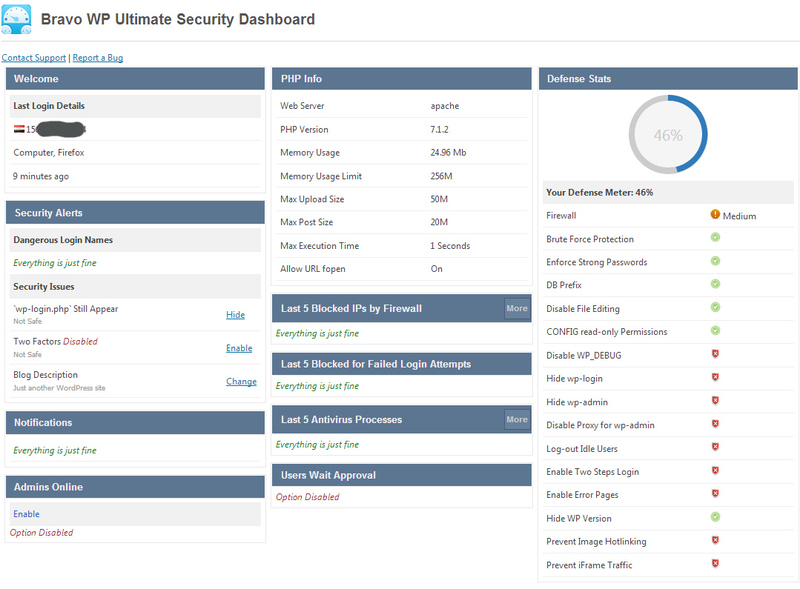 Brute Force Protection: The complete security for your and users’ passwords by activating Bravo brute force protection options. Blacklist Usernames: Prevent some usernames from register or log in. Blacklist email provider: Prevent some email hosting from register like e.g: mail.ru. Min & Max Usernames Length: Minimum and Maximum chars for registered usernames. Moderate New Members: New members will be need admin approval before they can use their dashboard. Accounts Protection: You are able to define the login method (email only or username only or both as default), No weak passwords, Maximum Login Attempts and Whitelist IPs. Who is Online (Live Tracker): Watch your online visitors and what are they doing? 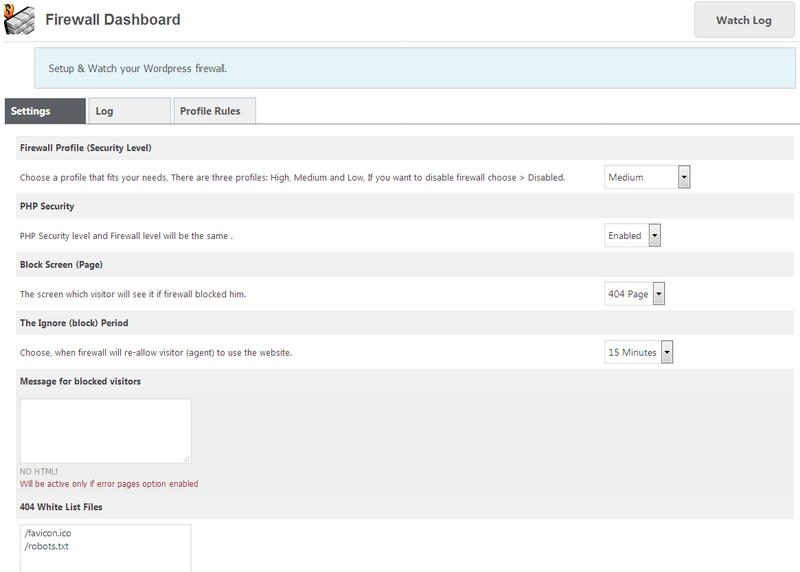 !, You will be able to see all their browsing details and block/unblock Ips. Inline Visitors Blocking: Watch your visitors activity using the traffic tracker module and you can block and IP or country when you see unusual activity. Cronjobs (Events Schedules): You have full control to set what is the appropriate time to run your events. 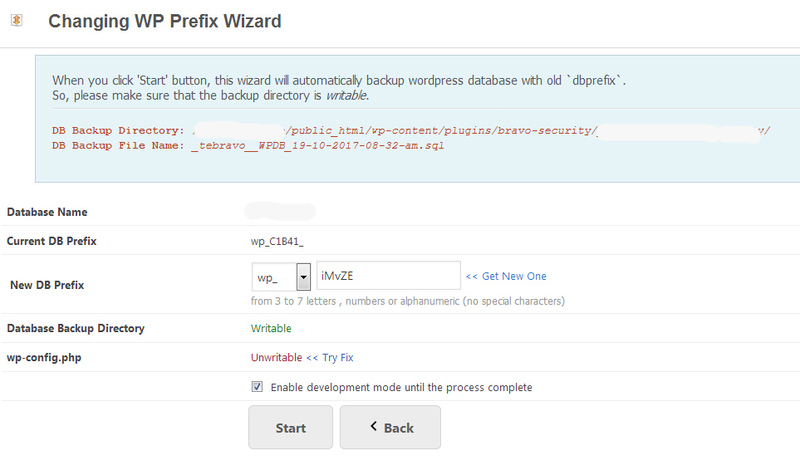 DB Prefix Wizard: A wizard was designed to change WP database prefix. Development & Maintenance Mode: There two modes in order to close your site, Development mode will allow some roles to view site as usual as they know it, but Maintenance mode will close site for all. Bandwidth Saver: Bravo lets you prevent ‘Hotlinking & iFrames’, Your hosted images will not show at other websites, and your website will be not shown in iframe. 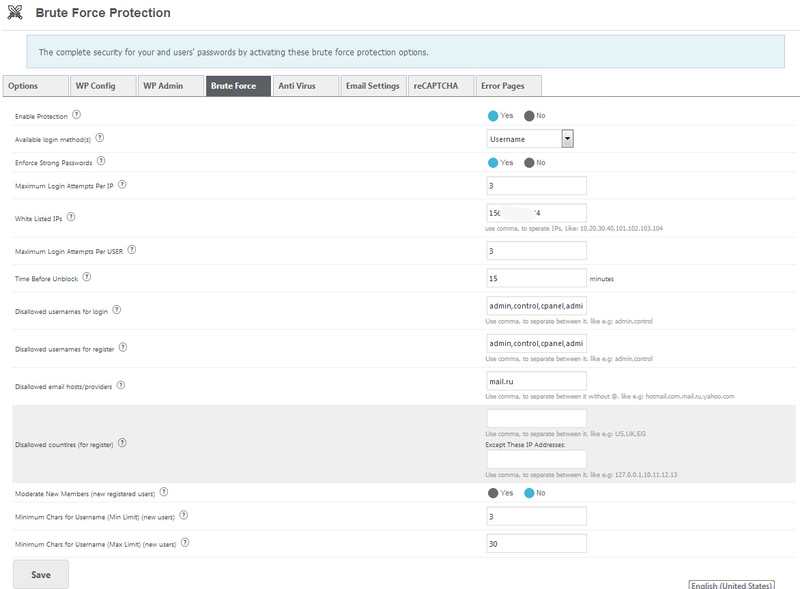 Plugin Self Protection: You can set password and choose some management roles to give them ability to manage Bravo. Idle Logout: The plugin will clear the current sessions for logged in users if they hold their accounts without using after (n) seconds, you will choose the duration before forcing them to log in again. Mail Watching: This tool designed for watching outbound email messages in WordPress. 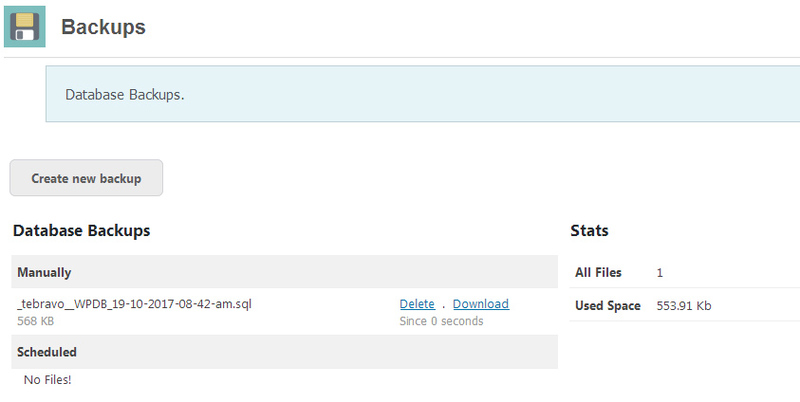 It can help if someone using backdoor in your blog to send spam emails. Error Pages: Continuing our efforts to hide WordPress, We designed this tool to use our 404 templates instead of your theme 404 pages. 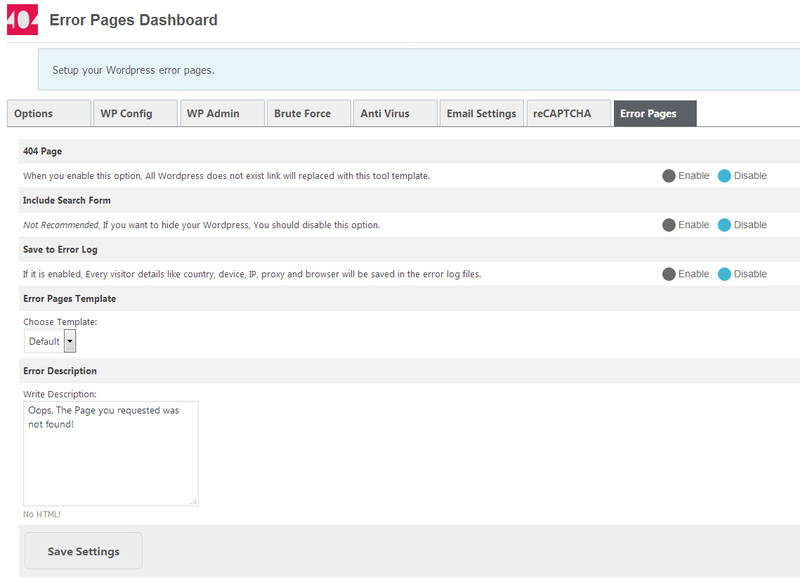 Log Watching: If you set the firewall to ‘High’ and disable WordPress debug, You can watch the error log using or tool. 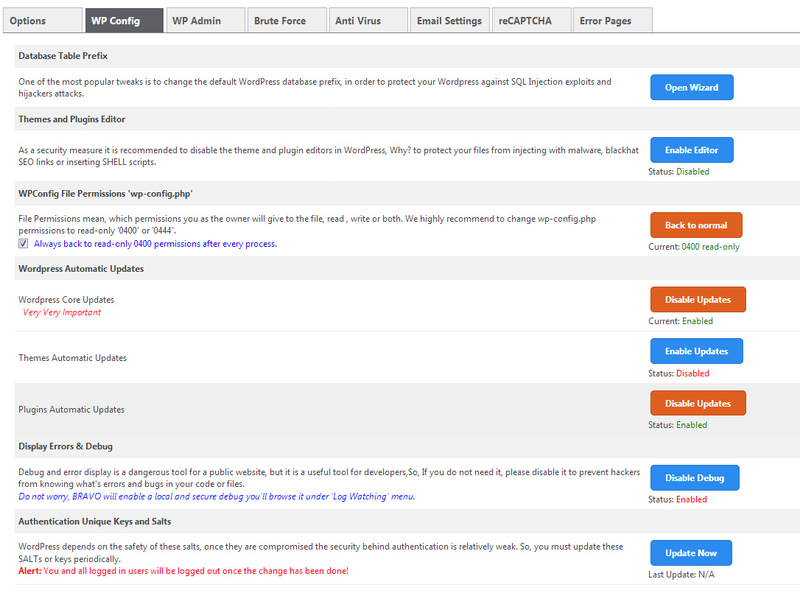 -Fixed: Multi-site issues with the hide WP tool. -Fixed: The new feed callback for hid WP tool. -Fixed: Traffic current page URL. - Hide wp-includes path from the page source. - Hide plugins path from the page source. - Hide themes path from the page source. - Rename search base and query. - Rename posts base and query. - Rename pages base and query. - Rename categories base and query. - Rename tags base and query. - Rename feeds base and query. - Rename pagination base and query. - Remove adminbar for non-admin users. - Remove feed links from the page source. - Remove API JSON links from the page source. - Remove resources hints from the page source. - Remove weblog client link from the page source. - Remove windows writer manifest link from the page source. - Remove post/page shortlink from the page source. - Fake HTTP Headers for X-Powered-By. - Fake HTTP Headers for X-Generator. - Change E-mail Sender E-Mail. - Change E-mail Sender Name.